An updated map showing various London locations where I have painted over the years. The green dots highlight places I have visited within the last twelve months, many of which are focused on outer areas, seemingly reminiscent of a green belt. My first ever blog post Putting my art on the map was published in February 2018 as an integral addition to my new website edmundpalao.com. 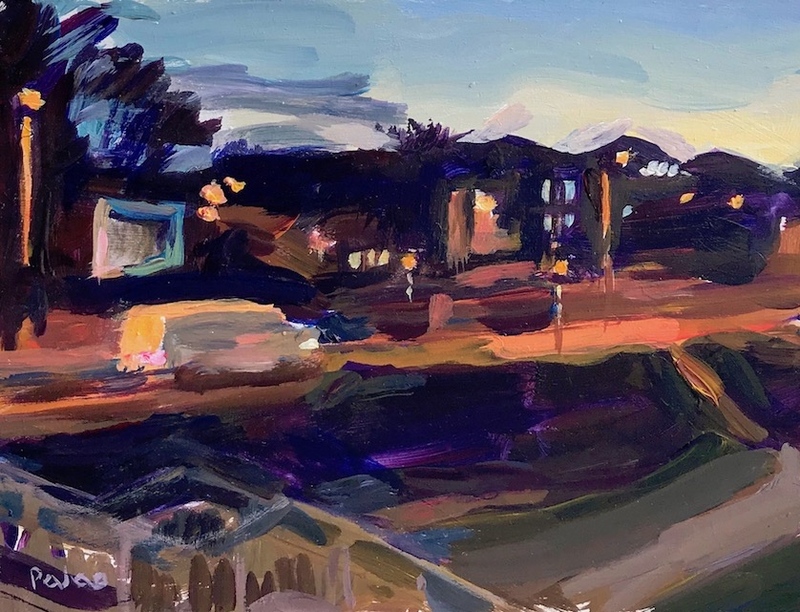 The article covered my philosophy and approach to creating paintings and why I am attracted to localised scenes in the capital and a search for a sense of place. It always feels good when returning to familiar painting locations such as the North Circular Road. One such picture titled Orion Road N10 at dusk gave me an impression of a journey home. The scene shows a van heading somewhere after the working day has finished, juxtaposed against a residential area in the background with illuminated windows. It seemed to depict a snapshot of humanity, an everyday experience elevated by a humble yet solid and undisturbed existence of a real place. 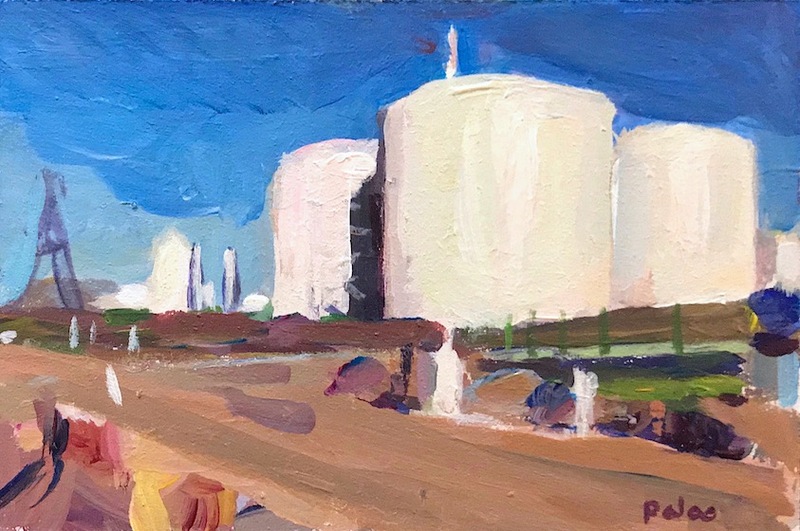 The Barking series I made had two intentions: one was to produce larger scale pieces of art and the other was to explore a brand new for me that featured vibrant landscapes of industrial estates, residential redevelopments and open spaces. ReFood, Barking was the first painting that I made for the series and, unlike the others I produced, it was very small in size but featured large scale objects of gleaming white cylindrical structures of a food waste plant which seemed to emanate a cathedral-like quality that carried an edifying sense of optimism. Acton Town siding depicts a platform view at Acton Town Underground station in West London. 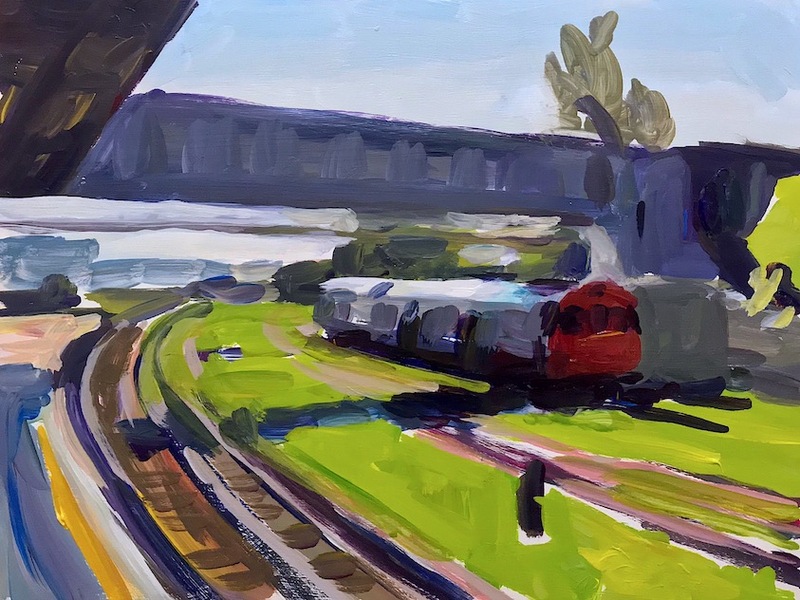 It features an everyday experience for a London commuter but the scene also depicts an odd set of train carriages that are not in passenger service, sitting idly on overgrown tracks. What I find so good about the Tube system is that it has a heritage all of it’s own that encompasses social history, architecture, technology and the arts. It reflects, absorbs, declines, renews and contributes to the areas in which it resides. I am committed to seeking places in London that reflect real lives, a sense of home and the experience of the everyday. The paintings above are all on display at Roy’s People Art Fair, Bargehouse, Oxo Tower Wharf, London April 3-7.